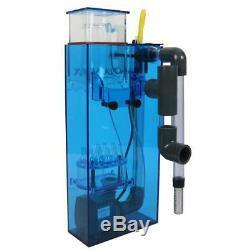 HOB-1.5 HANG-ON-BACK AQUARIUM PROTEIN SKIMMER - AQUAMAXX. With an enlarged bubble diffusion plate and reaction chamber, the new HOB-1.5 is able to fully harness the power of the Shark 1.0 pump to maximize foam production and protein extraction. The custom conical bubble diffusors help minimize the turbulence inside the reaction chamber and help to direct water linearly up toward the collection cup. More waste than ever is pulled out of your aquarium and into the easy-to-remove collection cup. AquaMaxx skimmers are computer-precision engineered and utilize the latest filtration technology to deliver the performance and value you are looking for in a protein skimmer. EASE OF USE AquaMaxx HOB-1.5 protein skimmers is easy to setup and maintain. Just move the collection cup up or down to adjust the foam level to wet or dry. Plus, every AquaMaxx protein skimmer includes a drain fitting for hobbyists who want to setup a separate reservoir for skimmate. Water quality and consistency is crucial to the success of a marine aquarium. An AquaMaxx HOB Series I protein skimmer will help to ensure that success. COMPACT DESIGN AquaMaxx protein skimmers were designed from the ground up with the hobbyist in mind. AquaMaxx HOB Series I protein skimmers have the pump placed inside the skimmer itself to save space, reduce noise and improve efficiency. All AquaMaxx protein skimmers are computer designed. Each unit is precision-cut and made of polished cell-cast acrylic. PERFORMANCE AquaMaxx HOB-1.5 Skimmers feature high-quality Italian-made Sicce pumps. Each Sicce pump motor block is then modified and fitted with proprietary AquaMaxx needle wheel impellers. With the precise modifications and upgrades, performance is boosted much beyond that of a stock pump. The upgraded AquaMaxx Shark pump is capable of drawing in significantly more air and chops them up to the optimum bubble size for protein extraction. These pump and protein skimmer combinations deliver unprecedented performance and reliability. Accumulated protein and organics will be vigorously removed from your tank so you can focus less on maintenance and more on enjoying your piece of the reef. Modified and upgraded Italian Sicce needle-wheel pump produces optimum bubble size for high-efficiency protein skimming. Simple to set up and operate. Dimension : L 7.5 x W 3.5 x H 17 Inch. Pump: AquaMaxx SHARK 1.0 (modified and upgraded Italian Sicce pump). Pump power consumption: 11 Watts. Requires approximately 4 of clearance to remove collection cup. Fits aquarium rims up to 3/4 thick. Each skimmer will include detailed instructions and diagrams to help hobbyists get up and running immediately. Our primary warehouses are in PA and AZ. Tracking information is provided with every order. Customers must allow an extra week of processing time for some items. We learned early on that going that extra inch can help your business tremendously. At SaltwaterAquarium we strive to do things different. We aim to keep things simple and only sell products we currently own or have used in the past. We know the products inside and out because, we use them in our reefs/tanks. We should be able to answer any question you have. Setting up our store in this manner makes for a better overall experience for you the customer. Tailor your auctions with Auctiva's. The item "HOB-1.5 HANG-ON-BACK AQUARIUM PROTEIN SKIMMER AQUAMAXX" is in sale since Tuesday, April 24, 2018. This item is in the category "Pet Supplies\Fish & Aquariums\Filters". The seller is "saltwateraq" and is located in Gettysburg, Pennsylvania.